This cake is so moist and dense that it can be difficult to determine if it is cooked. The baking times given are your best guide, and when cooked, the cake should have a thick, sugary crust. If you like, cut the crust off the cake, although the frosting will soften it. 1. Preheat oven to slow (150°C/130°C fan-forced). Grease deep 22cm round cake pan; line base and side with baking paper, extending paper 5cm above edge of pan. 2. 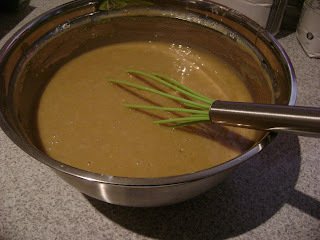 Stir butter, chocolate, sugar, and the water in medium saucepan over low heat until mixture is smooth. Transfer mixture to large bowl; cool 15minutes. Whisk in sifted flours, then extract and eggs. 3. Pour mixture into pan. Bake, uncovered, about 2 hours. Stand cake 10 minutes then turn onto wire rack to cool. 4. Make caramel frosting. Place cake, top-side up, on serving plate, spread with frosting. Melt butter in small saucepan. Stir in brown sugar and milk; bring to a boil. Reduce heat; simmer, uncovered, 3 minutes, cool 10 minutes. Gradually stir in sifted icing sugar until frosting is of a spreadable consistency. I had just only came back from shoping before i made the cake, so i wasnt about to go out again. i had just about 100g of white chocolate... for some reason i thought some cream would make up for the difference.. the cake was moist, dense.. very dense.. very sweet.. I used 1/3cup of amaretto tasted the mixture.. and tasted some more.. lol needed more amaretto and tested some more.. yummm .. lol do u see a pattern? the recipe makes alot of cake batter! I baked mine in a large loaf tin that i have.. i wasnt keen on putting it in a round cake tin or 2 slice trays.. i measured out my loaf tin and my round tin and found my loaf tin was larger in capacity and its a good thing it did too! Either because the recipe uses mainly plain flour or because its so rich with sugar.. it does not rise much at all.. nevermind that it cooks for 2hrs! The most expensive part was no doubt the amaretto! 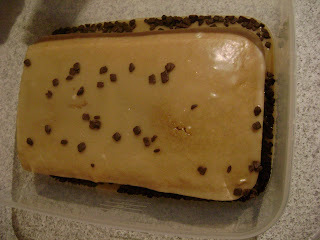 In the end i made a $15 mud cake.. lol.. just with the alcohol! i also added some thickened cream & some extra flour to get the consistency right. (mine was too runny thanks to the cream & amaretto) I also brushed some extra amaretto on top of the cake, to soften the crust and add more flavour.. 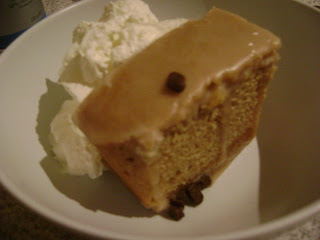 It was a great cake, terrible served cold from the fridge... but great at room temperature! Very easy to make in very little time. * i used choc thins in a lazy attempt to decorate the cake.. Interesting that the cake isn't good from the fridge. I usually like cold mud cakes (and frozen chocolate). 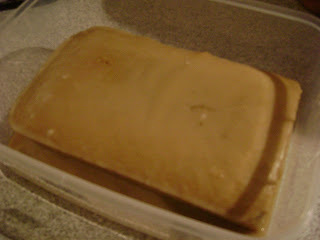 :-/ Now I'm in the mood for caramel mudcake. Do you like the Safeway ones? I generally do. Is the AWW book that chunky cookbook? The red one with white writing on the front? My sister in Brisbane wants it.. she says that an AWW recipe has never failed her. NO TAKEAWAY/FAST FOOD Challenge 3wks!! !